(Text automatically translated) It is an apartment with hardwood floors, moldings and fireplaces on the 4th floor with elevator, very clear and bright, tastefully decorated and sought and 3m high ceiling. This flat is everything it was described to be and more. Olga the caretaker was fantastic to work work with and very flexible. Plenty of space for 6 people. Easy access to Gare Nord train station...will get you anywhere in Paris and France for that matter. This flat was absolutely perfect for our stay in Paris. It was centrally located, only a 5 minute walk from Gare du Nord. The decor was beautiful, with large windows and a huge living space. This accommodation comfortably slept my family of 6 adults. Eric was very welcoming and gave us a tour of the apartment at the beginning of our stay. Would love to stay again when I return to Paris. 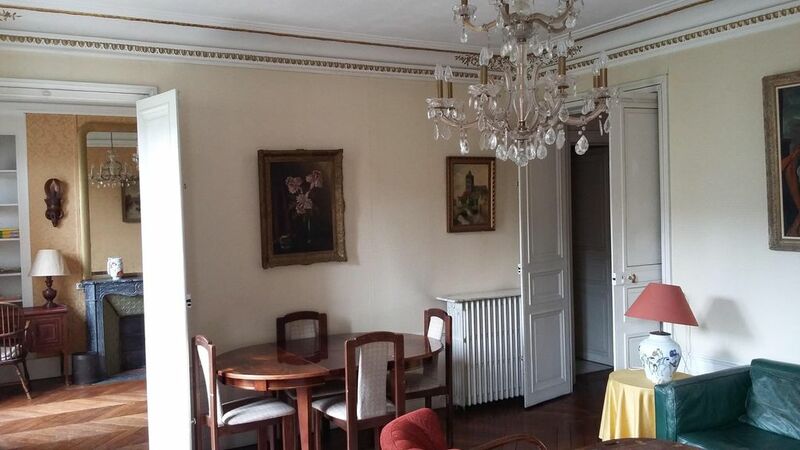 Excellent location for this large apartment with historic charm. Great experience except for lift getting stuck with our granddaughter and her luggage inside! Classic apartment in 10th Arrondisement. Amenities are a little dated, but working and comfortable. Owner is terrific. Great bakery a block away on the Bd. Magenta, several good restaurants within a short walk for the first night (e.g. Bar Magenta right around the corner). We got pizza at a local pizzeria one evening after a long day at museums, worked perfect. Funky immigrant neighborhood, with metro stop about 100m away. Excellent value all around. This is a typical old style Parisian apartment on the fourth floor (thankfully there is a lift) with large rooms and high ceilings. The layout is slightly awkward in that you have to pass through one bedroom to reach another. There are two shower-rooms (one is a shower over bath) but only one toilet which is in a room on it's own. The kitchen is small but has a dish-washer. Everything in the apartment is a bit grubby and worn. The decor is out-dated but I guess that is part of the charm. Faded grandeur is the phrase I think. The apartment has a balcony from which you can glimpse Sacré-Cœur. The apartment's owner, Eric, is a real gentleman. He replied promptly to our questions ahead of our visit and was there to welcome us when we arrived. He was very helpful indeed and spoke excellent English. The apartment is situated on Boulevard de Magenta just 5 minutes walk from Gare du Nord. The area isn't the most select but it does give visitors a feel of the real Paris. Montmartre's beautiful Sacré-Cœur and Place du Tertre are just a 15 min walk away. Boulevard de Magenta is a busy street. Like many Paris streets it can be quite noisy; sirens, horns, motorbikes, etc. We quite liked the hustle and bustle. But if you're looking for peace and quiet this may not be the spot for you. Being close to the Gare du Nord and Barbès-Rochechouart metro station is great. Notre Dame is just two stops south on RER B from Gare du Nord. There are several small supermarkets nearby. Bakeries are everywhere - we used one on Rue de Dunkerque. Rue du Faubourg Saint-Denis is great for fruit and veg as is the Marché Barbès on Boulevard de la Chapelle each Wednesday and Saturday, which is also a great place to spot local colour. But beware it does get very busy. All in all a great location to base yourself for a visit to Paris, as long you aren't too fussy about cleanliness and being in an unfashionable area. Mr Testelin was charming, answered emails promptly, and met us at the apartment. The apartment is a 5 minute walk from Gare du Nord (Eurostar), and although in an area that is a bit run-down (full of wedding clothing shops! ), we however did not feel unsafe. It is on a very busy Boulevard, and for the 2 bedrooms at the front, it was noisy with traffic and occasionally police sirens. The apartment itself is a graceful old lady of a Haussmann apartment, high ceilings, big rooms, elegant, but starting to be more shabby chic. It could do with updating of the paint work. The wall coverings are classic and stately, made from a textile. The apartment was clean enough, and plenty of crockery etc in the kitchen. One of the bedrooms has to be accessed through a choice of 2 other bedrooms. There is a separate shower room, and a shower over the bath in the bathroom which can also be used as an en-suite. There is one toilet in a separate room. Access to transport hubs was excellent, 5 mins to hop-on-hop-off bus stop, 3 minutes to catch the No.30 bus to Trocadero and Arc de Triomph, and 5 minutes walk to underground. We enjoyed our stay here. (Text automatically translated) North Station, nearby, gives you access to the Eurostar and Thalys trains and the RER B to Roissy-Charles de Gaulle airport. (Text automatically translated) Located just steps from Montmartre, department stores, pubs and famous cabaret of the capital.